Wonder of the World by David Lindsay-Abaire (Shrek the Musical, Rabbit Hole, High Fidelity) is a laugh-filled ensemble comedy that Variety magazine called “a fresh, absolutely hysterical comedy of marital discord run amok.” It tells the story of Cass, who discovers a dirty little secret in her husband’s sweater drawer and flees to the honeymoon capital of the world, Niagara Falls, on a quest to discover the life she missed out on. Along the way, the story gets wilder and crazier, including a strange caper involving a gigantic jar of peanut butter and an unusual Barbie doll collection, and Cass befriends a barrel-wielding suicidal alcoholic, a lonely tour boat captain, a couple of bickering private investigators, a birthday party clown therapist, and other colorful characters. Wonder of the World premiered Off-Broadway in 2001 starring Sarah Jessica Parker and Kristine Nielsen and was nominated for two Drama Desk Awards. “My favorite plays are the ones that make us laugh out loud and have a good time, but also have something fresh and meaningful to say—a ‘comedy with heart,’” said director Jove Graham (Pirates of Penzance, Of Thee I Sing). “This show starts out as a cartoon—a ridiculous story about a woman leaving her husband—but with every new character and plot twist, you get caught up in their search for the true meaning, wonder, and mysteries of life. It’s one of the funniest plays I know, and it’s also just a great exploration of freedom, destiny, and what makes us happy. It’s perfect entertainment for this time of year, a great play to bring a Valentine’s sweetheart or a group of friends to, and it was also perfect for RiverStage because it’s got so many great roles to showcase the comedic talent we have in this area. It’s definitely something different, and a guaranteed night of laughs.” Graham noted that, because of adult situations and some strong language, the show is not recommended for kids. 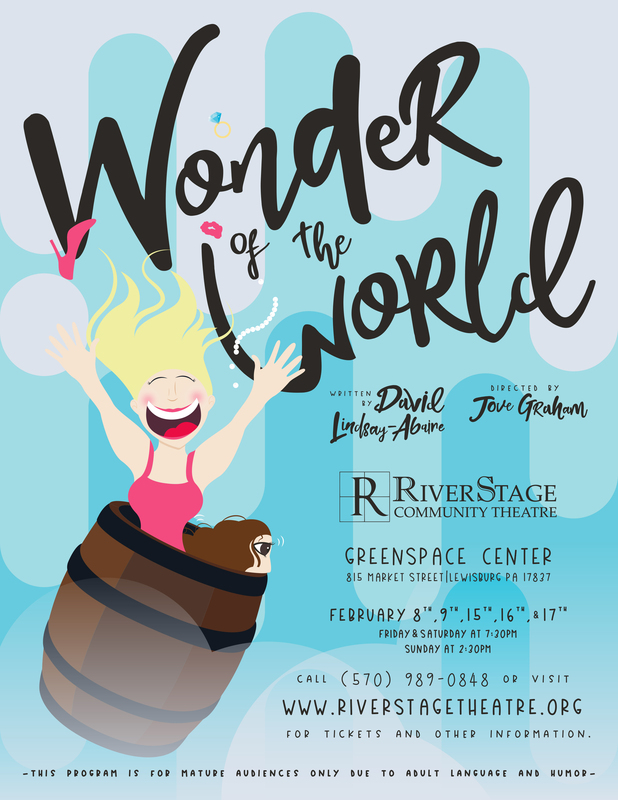 This production of Wonder of the World will feature an all-star cast of new and returning RiverStage actors from Mifflinburg, Williamsport, Lewisburg, Winfield, Milton and Northumberland who have appeared in shows across the Susquehanna Valley. Sasha Ernest and Rachel Mike, both of Williamsport, play the leading roles of Cass and her new friend, Lois. Broderick Miller plays Cass’s estranged husband, Kip, while Andrew Shaffer plays her new love interest, Captain Mike. Glenn Wilson of Winfield, appearing in his third RiverStage show this year, and Sandie Fairman, who has starred in and directed shows with Community Theatre League, CWC Productions and the Valley Players, play the amateur private detectives, Glen and Karla. Diane Scott of Lewisburg plays the freewheeling clown and therapist, Janie McShane, and other featured roles include a tourist named Barbara (Heather Swartz), an acrophobic helicopter pilot (Barbara Ross), and an overworked theme-restaurant waitress (Kathy Coup). Lighting design is by Patrick Maynard, with stage management by Ashli Starks and set construction by Peter Wiley and Dennis Merkle. See Who’s In the Cast!